Today I am very happy to share the pulpit with Scott Thompson. Scott is one of the co-leaders of our Science Sunday Forums. We had dinner a month or so ago and talked about this service and the relationship between science and religion. You probably will not be surprised to hear that our perspectives were different, but it may surprise you to hear our points-of-view shared some similarities. What we hope to do here this morning is recreate, in part, the dynamic we shared that night in a convivial, relaxed setting where everyone involved shared their perspectives with no goal of trying to persuade the other into changing their own perspectives. Rather, we simply wanted to learn more about each other’s perspectives on some the essential questions of life. Our deep affection and genuine respect for each other meant that we could have meaningful conversations about our different understandings of the relationship between science and religion. It was a great night where we truly lived our values with regard to our Unitarian Universalist Principles of accepting one another and that our individual searches for truth and meaning may lead to different places. You are now invited on this journey with us. I am a Buddhist, Humanist, Panentheist, Unitarian Universalist minister. I believe that religion and spirituality are meaningful terms that can be useful in a person’s life. I believe there is a ineffable force in the universe that affirms life, that exists in all matter, and that can be experienced through prayer or meditation or personal reflection. I am speaking about my beliefs, not of the beliefs any other Unitarian Universalist. Ours is a values-based religion, not a belief-based religion. Our values are affirmed in our seven principles. The sources Unitarian Universalists turn to in our own spiritual quest for truth and meaning are personal experience, Jewish and Christian teachings, the world religions, earth-centered religions, humanist teachings, and the wisdom of women and men through the ages. I feel it necessary to share my definition of spirituality and religion because these are terms that I will be using throughout my presentation. For me, spirituality is a personal quest for truth and meaning. For me, religion is a communal quest for truth and meaning. The dictionary defines spirituality and religion in terms of a belief in a god/gods/goddess, but many theologians today have embraced a broader definition because there are religious traditions, like Zen Buddhism for instance, that do not consider a belief in a god/gods/goddess central to their tradition. In other words, the definition of spirituality and religion that I embrace includes all the ultimate questions of existence—including whether there is a god/gods/goddess, an afterlife, sin or salvation. For me, spirituality and religion also offers an underpinning in the development of a moral code; the offer frame for organizing meaning and purpose from life’s experiences and from internal reflection and include personal and communal rituals, practices, literature. Religious texts like the Bible are not historical documents. They can offer people who wish to explore their faith stories, parables, wisdom literature, hymns, and aphorism that when reflected upon may deepen and broaden a person’s worldview and expand their empathy. I find meaning and truth in many different religious traditions. I find Religion is not about facts or scientific truths, it is about making meaning out of our lives and experiences; about finding truth, values, and ethics that guide us in our decision-making. I believe that science has provided many advances that have enhanced our lives. I also believe that science is amoral—neither moral nor immoral. “Science is a systematic enterprise that builds and organizes knowledge in the form of testable explanations and predictions about the universe.” (Merriam Webster Dictionary) Using the scientific method, we have learned many things—how plants create chlorophyll, how light travels through the earth’s atmosphere, how electrical pulses through the body result in movement, digestion, thinking. For every question that we answer using this method, more questions arise, more knowledge is gained. Science is an unending process of learning, organizing what has been learned and using that knowledge in ways that can be useful for humankind. I go back to my belief that science is amoral. Science is about testing and accumulating knowledge—a great thing. I am all for it. When it comes to things like whether we develop genetic kits that allow people to change their own genetic codes, something that may soon be possible, I have a question about how—and where—people will find their grounding, their framework, to make a decision about whether to use that scientific advancement in their lives. What are the reasons, values, morals, the truth, meaning, and purpose that come to bear when we are called on to decide things like making these kits available, deciding what to change within ourselves, whether to use that kit on someone else. I know that this advancement can result in cures for Downs Syndrome in vitro, and type 1 and type 2 Diabetes. How do we decide who will have access to this treatment and how do we re-define pre-existing conditions? Will only those who can afford this treatment have access to it? And what happens when we can change traits, characteristics that are deemed advantageous—eye color, skin color, height? Who will have access to that technology and for what purpose? Science gives us the tools and knowledge, a valuable and important thing in our lives, but not the ethics and morals that ground us in this kind of decision-making. 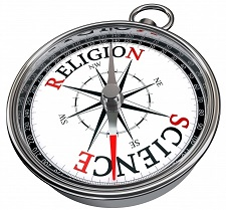 Religion provides a communal affirmation of values, morals, meaning, purpose. Some of us here might not agree with some religion’s affirmations—for instance, I don’t believe that the Christian Bible is the absolute truth given to humans by God and that it provides concrete specific directives about homosexuality, birth control, and women’s rights. I hold this nonbelief because we have learned a great deal through science. For instance that homosexuality is not a disease or defect; that birth control is a safe and effective; that no human being is inherently inferior to another because of gender or race. Religion without science is blind. I do believe there is value in taking time to reflect upon our personal and communal answers to the ultimate questions of existence before acting upon a scientific discovery. If we discover a new, efficient, and easy way to make sarin gas, what informs our decisions about how to use this new process? What is the framework? Do we reflect upon our morals, ethics, values, the meaning and purpose of our lives, before deciding how to use the science? And how does being in a religious community that affirms life impact our decisions? Does participation in religious community that keeps our values at the front of our consciousness inform and underpin our decision-making process? I believe without a values-based community, the implementation of scientific discoveries can veer off, can lead to the use of science for destructive purposes. Making better weapons for instance. Science without religion is lame. I believe there is positive value in communally affirming our morals, ethics, and values, our life’s meaning and purpose. Certainly we do that individually, but here’s the thing: affirming our values on our own—in a vacuum—can result in rationalizing any decision that we make. I didn’t say “will”; I said “can”. We are imperfect beings and the ego has a very strong internal voice. When we affirm what we believe and think out loud in a community that we trust, we can hear other viewpoints that can encourage us to experience the world in its complexity, it blacks, whites, and greys. In community, we are more easily able to test if our beliefs are values-based or mere rationalizations. Finally, let me address one religious issue that we might talk more about in our discussion. Is there something out there beyond what we can see, smell, taste, and touch? Is there a god/goddess, a divine being? I don’t factually know. As I mentioned earlier, I do believe in the divine spirit in all things; panentheism. I do believe that the divine is not a static thing or an anthropomorphic entity. I believe life and matter and I share something. Can I tell you what that is, besides atoms and chemicals? No. Does my belief keep me from embracing science? No. Does my belief make me somehow irrational? I don’t think so. What my belief does for me is make me think twice before taking action that might result in hurting or damaging anything around me. My belief calls me to treat all that is around me with value, as sacred, to be cared for, even treasured. My belief is not factual, cannot be scientifically proven, at least not yet. My belief is something I have come to over my 58 years of experiences in the world. My beliefs might change, but I know that in this religious community, I can talk about my faith, my values, and my personal meaning and purpose and they will be heard and respected, and I will be encouraged to live my faith, values, meaning and purpose. Thank you for inviting me to share my thoughts with you today. I do so in the spirit of a free and responsible search for truth and meaning. Thomas Paine, a philosopher and one of America’s founding fathers wrote, “The world is my country, all mankind are my brethren, and to do good is my religion.” For some, the definition of “religion” covers a vast terrain of potentiality. It may equate to a world-view, a personal philosophy, even just a set of cultural practices and norms. Within this context, some religious views may lead to conflict with science, and some will not. In this expansive definition of religion: atheists, freethinkers, Buddhists, rationalists, Toaists, Hindus, humanists, Christians, empiricists and all people across all time are or were religious. When I think about science and religion , I don’t typically think about Thomas Paine and religious Humanism. I think about Galileo. The universe he saw through his telescope countervailed accepted doctrine of the Church. A prominent church cardinal purportedly looked through the telescope himself, and still refused to believe the astronomical evidence he beheld. The Church condemned Galileo and placed him under house arrest. They forced him to recant his heresy, or face mortal peril. His contemporary, Giordano Bruno was burned alive by the Inquisition for his radical thoughts and words. Many religions still promote the denial of scientific evidence. Usually when people consider religion, they refer to the relationship some seek between themselves and believed-in transcendent, supernatural entities. Such an entity may be a great force, a spirit, a god or a saint. For some, a deity is the wellspring of creativity, and love and wisdom. There are many variations on this theme, and in many places and times, people have believed, still believe, in a whole pantheon of goddesses and gods. Do you ever wonder about the fate of the gods no longer believed-in? In any case, this sort of religion, supernatural and transcendent, is my focus today. As I noted, some see creativity as an inherently religious experience and expression. Certainly, in the name and service of religion - much art has been brought into existence: Bach, Michelangelo, the occasional poetry of the King James Bible, were created in service to religious ideals. In other instances: Shakespeare, Van Gogh and the Beatles - there is no connection between their work and traditional religion. Religion is not necessary for creativity, otherwise the irreligious would never be creative. This is a logical deduction; the sort scientists make all the time. Today, I only note in passing that religion and the arts, religion and free speech and free thought can sometimes coexist and sometimes not. Our focus today is on the coexistence of religion and my favorite subject: Science. Science concerns a systematic, self-correcting process of discovering all that is real and true and possible in the universe. Note I said “all” that is true. If something happens, even rarely, it is subject to examination and explanation. Things are real, or they are not real. Events occur, or they do not. There is nothing that can be experienced - including illusions and hallucinations, which cannot be reconciled with the natural world. New discoveries do happen, and they cause a change to what was previously thought to be real or possible. Science is a process for understanding and discovery, and a growing encyclopedia of knowledge concerning all true things and occurrences. It is another word for reality. Science is humble before nature. It is mutable, changeable and inquisitive. This may seem like nonsense to some who perceive science as arrogant, or an idolizing of human capabilities. Consider this: It is arrogant to assert that knowledge of something real, but unprovable can be revealed to a single privileged mind. The litmus test of science, pardon the pun, is evidence. An assertion made without evidence, a faith in things unseen, is just science fiction or superstition. There can be great friction between science and many religious ideas and traditions. When assertions are made that something is real, whether it’s a ghost, the efficacy of sacrifice, a force, a rain-dance, or the existence of intelligent beings who communicate directly to the minds of humans, those assertions need evidence to justify their inclusion within the encyclopedia of reality. Else, they’re just opinions or flights of fancy. Fantasies can be fun and artful, but if taken seriously, they can lead to great harm. Let’s talk about miracles: Surprises and accidents - happy or horrific, do happen, but they are not miracles nor the action of deities. Humanity has long since moved away from attributing the surprising or unknown to the work of gods and spirits. Let’s keep that up! Surprising things, strange coincidences, baffling things, are most likely well understood statistical flukes. Coincidences - like when I sneezed and the phone rang, are just coincidences, and no reason for superstition. Rare things and events are not miraculous, they’re just rare. No miracle, no curse or blessing, has ever been shown to change the world or even a person’s life - aside from the social and psychological effects contingent upon belief in these things. Some believe morality to be the exclusive realm of divine religion. This is arrogant and false. In his book “The Moral Landscape”, Sam Harris asserts that our ethical choices usually relate to optimizing human joy and wellbeing. This is consistent with the broader idea that much of our morality derives from the physical realities of our body and environment. For example: If I were more akin to a starfish then ripping off one of my arms would be a mere misdemeanor: Soon enough, I’d grow another back, good as new. You see, things could be different, and if they were, our rules would be different. But there would still be some rules, in accord with our common nature. Realities of nature, including biology, put limits on moral relativism including post-modernist nonsense which assert there are no truths. Science tells us that all human beings have more in common than in contrast. Common capacities for understanding, for love, for pain, for creativity and for making moral decisions. Science supports no basis for treating human beings differently due to their Hindu caste, their gender, their culture or because of any of the other ways we separate people into groups and denigrate whole populations. Because of this, we hold some essential moral truths to be universal and self-evident. Our founding fathers got that part right about 250 years ago and they wrote it down. Why didn’t traditional religions? Dualism is inherent in many religions. The idea that your inner life and your mind or spirit are separate from your physical existence. Incorporating this into moral codes devalues human beings, and leads to horrific outcomes, like the heinous acts of religious zealots. All the evidence we have only confirms that mind and body and feelings – derive from biology. Beautiful, complex, precious biology. This view, of the value and unity of our persons has informed our laws, and we are much better for it. Ignorance can be deadly - whether willful or not. Gaining insight into nature including human bodies and minds, is the optimal way to overcome ignorance. For example, psychological science tells us that people would often rather die than be shamed, that dispositions for both fairness and vengeance are born into every human being, and that we are more motivated by fears of loss than we are excited by opportunities for growth and gain. These are facts that derive from our evolution as social beings, and like all real scientific findings, they are true regardless of your belief. The bright path hewn out of the forest of human ignorance by science, leads to far better insights and outcomes than other avenues of investigation. Still, there is no scientific calculus, or legal code, that consistently yields perfect solutions to the constellation of problems, practical and moral, we continuously confront. Most of the solutions deployed against real-world problems strive for a normative balance between harms and benefits. While the benefits can be spectacular, the harms can often be heart-wrenching. This is further reason to do our best. Codes derived from revelatory and dogmatic religions most often lead to far, far worse outcomes - evidence proves it. This belies the claim of absolute moral superiority and ultimate wisdom made by many religions - claims supported by pious arrogance but paltry proof. The best path to joy, fairness, prosperity and wisdom is the realistic path, the scientific path. It leads to practical and moral applications. The domain of science is all that is real in the universe, including morality. Science grants a realistic view of the possible, of the commonalities that bind us and the limitations we must work within. The pursuit and appreciation of religion and science can coexist in two ways: First, in cases where religion is broadly defined but includes nothing supernatural. Second, where religion is a thing of the heart, of hope, of inspiration. Where it inspires a sense of something greater than one’s self - so long as this does not lead to mistaken claims about what is real, true and testable. Otherwise, there may be great friction, and the burden of proof will find religious supernatural claims wanting. I am completely confident of this. On the other hand, contrary to common misunderstanding, the sciences can help us build a more moral world, not just a more technologically advanced one. The 20th century biologist and public intellectual Stephen J. Gould was wrong when he asserted that science and religion are “non-overlapping magisteria.” The overlaps are frequent and perilous. In cases where dogma, where various interpretations of ancient texts, where flashes of inspiration, stand in stark conflict with natural reality - we have a choice: If we don’t ensure that clear-eyed scientific realism guides our policies and decisions, including decisions about how we treat one another, then we imperil our world and our selves. This is not an idolatry of the mind. It’s a prescription for doing our best to make the best of the real world we share.